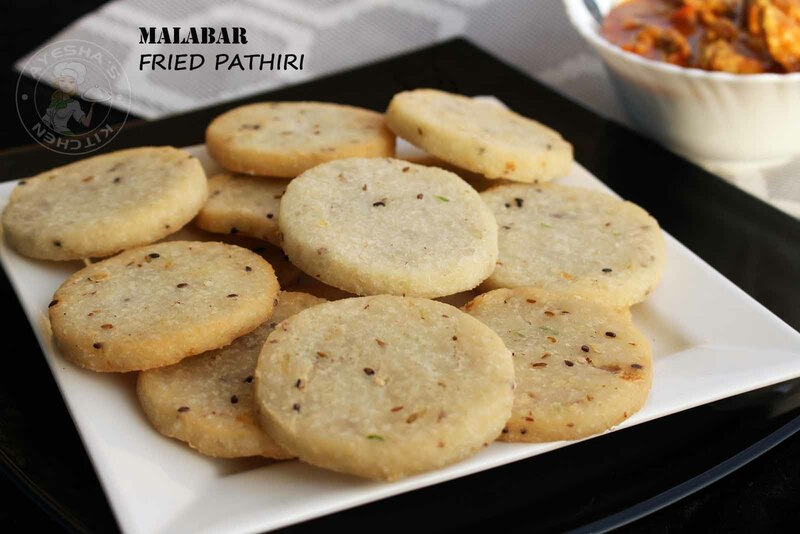 Fried pathiri is a pancake made of rice flour and coconut mixture which is deep fried rather than baked. This pathiri or pancake is different from Malabar rice pathiri which is baked. This pancake recipe is very common and popular among the people of malabar (Kerala state of southern India). Nowadays these pancakes are very common in countries like Uae, Oman, Qatar, US, UK also only because of its taste and popularity. Here am sharing the recipe of fried pathiri / yenna pathiri / poricha pathiri which is yet another popular snack or breakfast recipe in malabar. 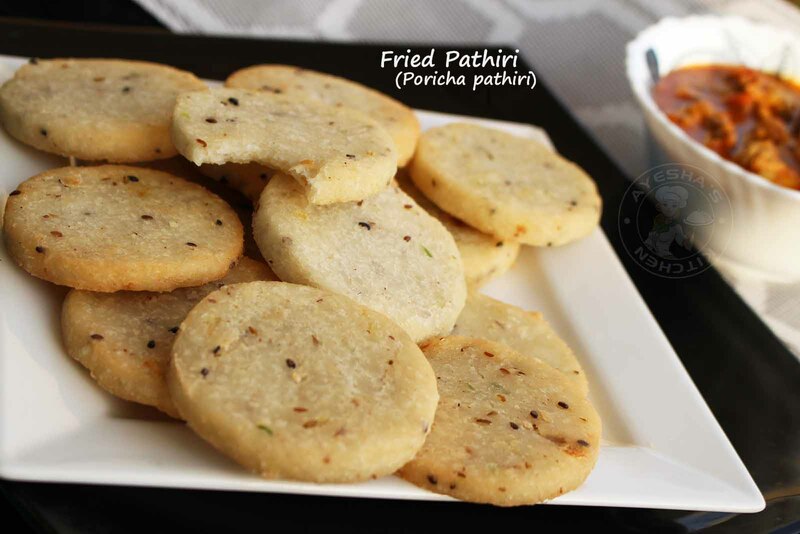 You can see this poricha pathiri / fried pathiri in almost all tea shops or thattukada as an evening snack especially during Ramadan in Kerala. 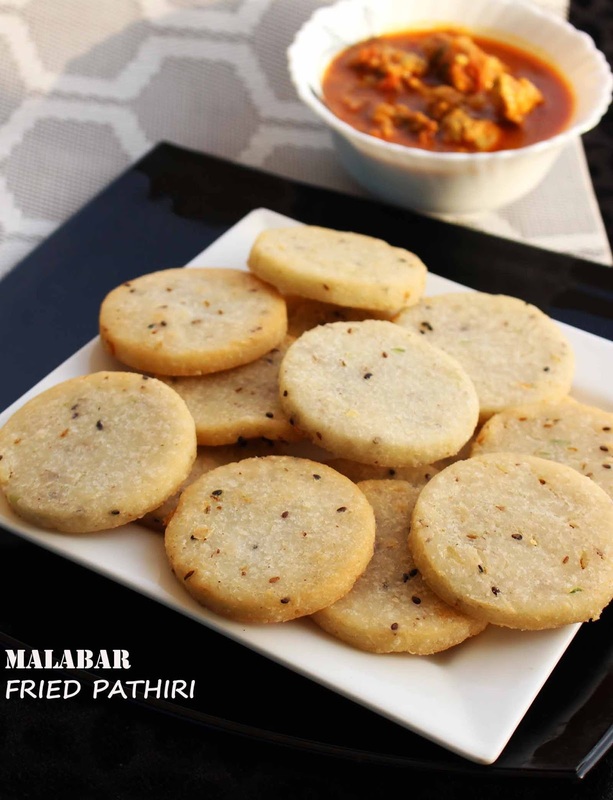 It tastes super delicious with malabar chicken mulakittath. Crush the onion mixture and set aside. Do not grind it (very important). Just pulse for a second or two. Set aside. Keep aside all the ingredients ready. Now heat a wok (preferably nonstick ). Add ghee and make the flame low. To this add the crushed onion mixture and saute well for few minutes. Do not allow it to change its color. Once done, add a cup of water and make the flame to medium. Allow it boil. Once it starts to boil, add salt. Mix well. Simmer the flame and then add rice powder. You must add rice powder little by little stirring continuously(very important). Stir well with a wooden spoon or spatula. Keep mixing with the spoon for 2 minutes over low flame. Then remove from heat. Transfer to a flat tray, so that it will cool slightly (hot enough to handle). Meanwhile coarse grind the coconut mixture and add it to the prepared dough along with black sesame seeds. Knead it to a very soft dough. Be careful that once the dough cools well, it is very hard to make a smooth dough. So knead it when it is hot ( the hot you can handle). Divide the soft dough into 2 big balls. Take a ball and roll it into a thick pathiri or chapathi. Should have a minimum thickness. With a cookie cutter or round lid or glass, cut them into small round pathiris. Transfer to a paper towel or absorbent paper. Serve hot along with malabar chicken curry. Actually, it tastes even with a nice cup of tea itself.